Hoping to provide a bare-bones electronic drum kit to take anywhere, Simmons has released Stryke6, a portable bank of six drum pads and two pedals that hook up to an iPad, laptop or desktop computer. The laptop-sized surface provides six backlit velocity-sensitive pads that respond in proportion to the strength of your hits, and the two pedals take care of hi-hat and bass drum duties. There's also a pair of plastic sticks included, if you don't have wood already. 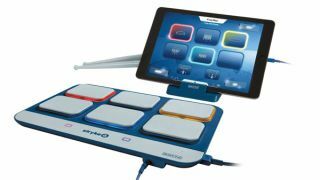 While the setup comes replete with USB and lightning cables to hook it up to your PC or Mac, the focus is on the iPad connection, which lets Stryke6 communicate with Simmons' free Stryke Drums app, an interactive environment for playing and learning. Anyone piping it into a computer should soon find it capable of controlling many of the top drum kit software such as Toontrack's EZdrummer, as well as being configurable as a MIDI controller for other uses.